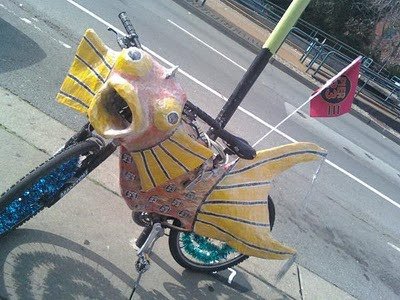 Why ride your regular average every day bicycle when you could ride a fish bike? Snapped here (and on Meli's blog too) in front of Pier 23 on the Embarcadero. 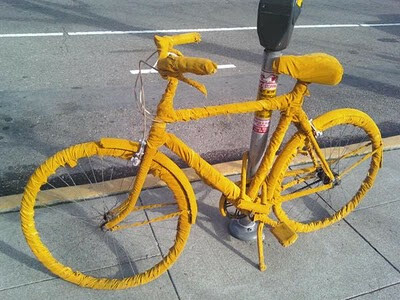 Or if fish ain't your thang, then wrap your ride in yellow corduroy from handlebars to derailleur. This reminds me a bit of Adrienne's ambition to crochet a bike. Perhaps this is what it would end up kinda looking like. What eccentricity! San Francisco must be a lovely place to call home. Indeed, Cameron! I love my hometown! Apparently these bikes are some kind of marketing campaign for Levi's, and there is some talk about giving them all parking tickets for taking up space. See Change Your Life, Ride a Bike.